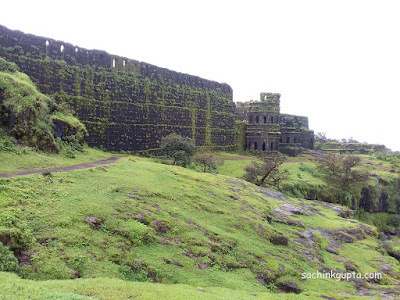 Fort Raigad is much more than a mere tourist spot, it is a sacred pilgrimage. This is the fort where Chhatrapati Shivaji Maharaj was crowned and he took his last breath. Raigad is a hill fort situated in the Mahad, Raigad district of Maharashtra, India. Raigarh is approx 200KM from Mumbai and 150KM from Pune and approx 140KM from Satara. From Pune, one can reach here via drive through Mulshi Dam and beautiful curves of Tamhini Ghat. 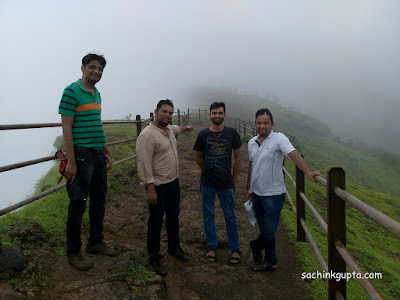 We planned our much awaited team event this monsoon. All the friends were quite excited about the trip. A motor-able road leads to Chit Darwaja, about 2kms from Pachad, the village at the base, where lies the Samadhi of Jijabai, Chhatrapati Shivaji Maharaj’s mother. A long climb from Pachad takes one to the Mahadarwaza, flanked by two massive bastions and a high curtain wall. One has to climb approximately 2-3 hours with 1400-1500 steps in order to reach the top of the fort. But we opted for ropeway as planned. Raigad Ropeway has opened a new dimension of sightseeing at the Fort Raigad in Maharashtra. There are cable cars/rope-way which take the visitors from base of the hill to the top of the fort and back. It's definitely a clever option to opt for, if you don't want to climb the full trek or don't have enough time. With this you can spend more time on the fort itself. Just near the ropeway starting point, we have small Museum displaying artifacts which have information about Shivaji Maharaj, forts in Maharashtra and other details. Take a note that you have to wait for about '30 minutes to 1 hour' for ropeway trip in normal days, and upto 2-3 hours during peak season days. Two ways ticket for adults was 200 INR per adult and flight time is approx 4-5 minutes. Ropeway in itself could be thrilling experience for few and heaven for others, specially during monsoon. Raigad fort in rainy season is awesome to visit and experience of Ropeway acts like a cherry on cake. A flight through the clouds, whistling winds, full of rains, and cool foggy trip! The sun was playing hide and seek. Many waterfalls and amazing greenland views can be seen while being at ropeway. The Ropeway drops you near Mena Darwaja. The fort’s 5.12 sq. kms hill-top plateau, has three main points Hirkani in the west, Takamak in the north and Bhavani in the east. Meena Darwaja: a special entrance for the royal ladies and the queens. Hirkani Buruj: Just on the top, there is MTDC resort nearby. Queens Palace: Its ruins today consist of the queen's quarters: six chambers, with each chamber having its own private restroom. Each one is bigger than 2 BHK flats. Palkhi Darwaja: The convoy of the king and the king himself used this gate. The 12-sided two-storey towers just look awesome during monsoon, this place is must seen place of the fort. Ganga Sagar Lake: The picturesque place contains main water reservoir for the fort. Holicha Mal: It is a wide-open ground, used for annual Holi festival. There is a temple of Shirkai Bhavani, a presiding deity of the fort. Market place (Bazaar Peth): There are few small shops selling few snacks and drink at many places. Takmak Tok: a cliff point from where the sentenced prisoners were thrown to their death. This is a must visit point, but the area is now fenced off, so please be aware of while walking. Jagdishwar Temple: The floor of temple is super cool in monsoon, as we were bare feet. We also had chance to meet Marathi delicacies at one of the villager's home. It was economic and an experience in itself. Raigad Fort is worth visiting over the weekend with your family, kids (If taking rope-way) or even as part of project groups. Everyone - Gaurav, Gyanu, Paresh, Sarika, Vaibhav, Vijay had lots of fun throughout the trip. Raigad fort is ideal for camping. If you are planning to trek in the night, ensure that you are trekking with experienced trekkers and have good flashlights with you. One can stay overnight, at the top of the fort. We would love to go this place again, and will definitely plan for an overnight stay. nice photos. It looks bit scary. enjoyed? Very good work and nice written!! and waiting for next post!! I recently visited Raigad fort, this is really really must visit fort in india. highly recommended. you have taken nice photos. please share more.